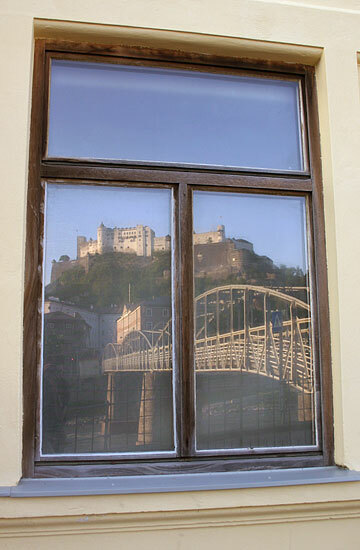 Salzburg Fortress or the Festung Hohensalzburg is reflected in a window facing the Altstadt with the Mozartsteg Bridge and the Salzach River in the forground. The Salzburg Fortress is the biggest of its kind in central Europe and makes quite an attraction from pretty much any angle - therefore, it is difficult to find unusual or original perspectives on the Salzburg Fortress. This shot is an attempt to show an unusual interpretation of the ′Salzburg-ensemble′.